I saw them every day and night. I see them now. They were inside those helmets, behind those crash visors. They bore Grim Reaper and Soaring eagle patches on their shoulders. I never knew their names. They flew bombers, sleek machines, bellies loaded with seven hundred and fifty pound messages of death for the enemy. Strainining wings, loaded with shining cylinders of napalm infernos. Twin jet engines B-57. These Knights of the air satalmly in the cockpits as we charged the cannons and armed the bombs. We were the ones who shouldered the responsibility. Their lives depended on our work. They counted on us. I never knew their names. How crushing were the fears that they faced on every mission? They were going out to kill, or be killed. When the wheels went up, they knew this flight could take them directly to God, or into the hands of the enemy. What did they think of us? Did they take pride in our awe and respect of them? Did they draw strength from our simple chalkboard messages? " God speed"--- " Kill the Cong". A snappy salute, thumbs up, throttles wide open. Destiny awaited them. We, were left standing on the ground. I never knew their names. We sit in the dark waiting their return . "Spooky is working over some poor bastards in the nearby hills. We can see his flares and tracer streams. All ears are stained. We listen for that telltale engine whine. Did they all make it back? Are there any wounded? No crash trucks tonight. We breathe a sigh of relief. Touch down, taxi in, ground lights on. Frantic moments that must have seemed like years. George " The Weed", Donnie, Kulpie, and the rest, we all took our turns. Just us, and the light cart. Search lights that pointed out to the enemy exactly where you stood, for miles around. All the pilots could do was sit there helplessly and wait for us to do our jobs. They were home from the fight and yet they were still potential targets. The speed with which we dispatched the disarming kept us from seeing their faces or noticing their fear or fatigue. What were they feeling? Were they grieving the loss of comrades? Were they sharing the thrill of a victory? Were they elated at just making it back alive? I never got to share those feelings. I never knew their names. Those troubled times are long since passed, yet in my memory, they will always remain. Those brave men who fought the fight will forever abide in my minds own "Twilight Zone". Some lived, some died, some, may even yet be prisoners. I felt ten feet tall when I helped send them on their way. I had no thoughts that some of them might never return. I know some of their names now. I've seen them, etched into a black granite wall. The 8TBS was moved to Clark AB, Philippines as the Third BW was deactivated. 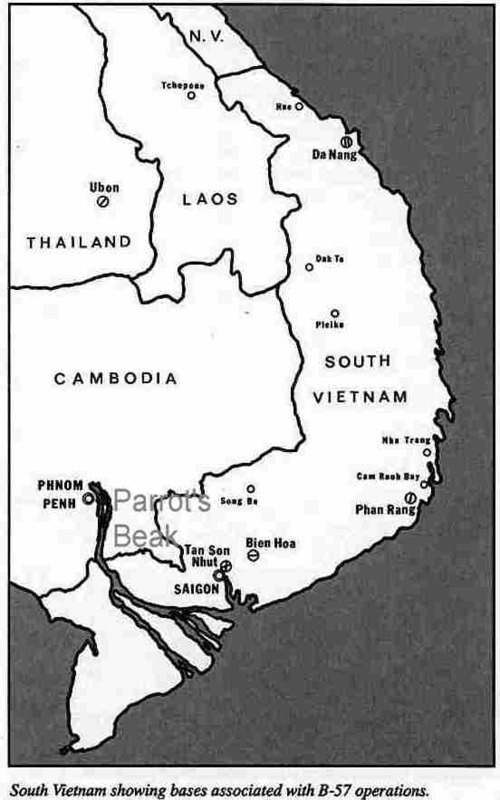 The Gulf of Tonkin incident was the impetus to move the Canberras of the 8th and 13th on a temporary duty status to Bien Hoa, and finally to Phan Rang permanently as the B-57 took on the role of Night Intruder on the Ho Chi Minh Trail. The 8th Tactical Bomb Squadron was the oldest squadron in the Air Force to serve continuously from its inception in WWI to its deactivation as a bomb squadron in 1969. It was called the "Liberty Squadon" in tribute to the famous Liberty Engine which powered the DH4. 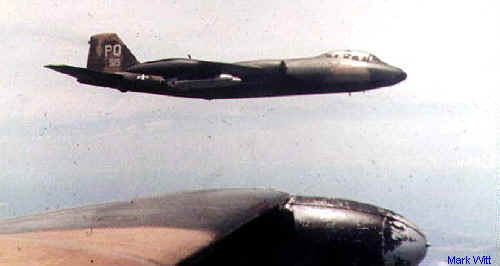 The 13TBS was deactivated only to be reactivated and returned to Southeast Asia with new laser system using the B-57G. 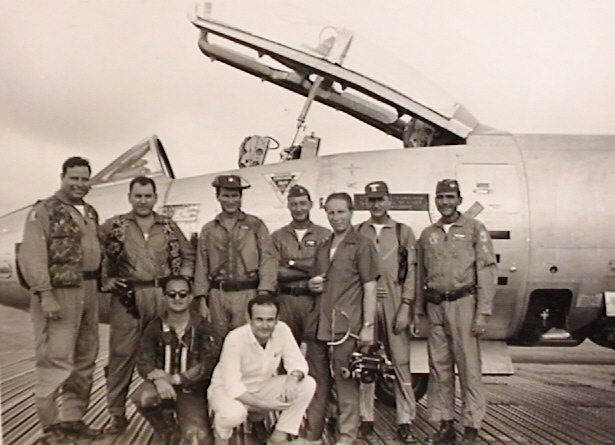 Rare day mission training new pilots in VN (1968). Note the 8TBS markings PQ. (The 13th had left VN by this date).